Squid are one of the southern water’s favourite angling targets. On any given day hundreds of keen anglers are chasing these cephalopods. As far as an angling target goes squid are one of the most versatile. Admittedly a squid will not strip one hundred meters of line off a spool, nor will a squid battle it out for hours. So why are squid one of the most popular angling targets? 1. They are one of the best and most versatile baits available. 2. Squid are one of the finest and most popular seafood’s. 3. Once located bag limits are easily obtained. 4. They are great fun for anglers for all ages.Really the list is endless. So what is the best way to get a couple of these critters in your creel? Squid fishing in Victoria is big business for tackle stores. There are many different styles and sizes of squid lures. Tackle from hand lines through to bait casters is employed, all in the aim of securing a brace. The following is a guide on how to set-up, find and finally catch squid. These techniques have proven extremely successful for me over the past twelve years. The majority of the squid I catch come from the Mornington Peninsula, in Melbourne’s Port Phillip Bay and it’s here where these techniques are derived. I hope that I can provide you with a few pointers that enable you to increase your productivity. Squid inhabit reefs and sea grass beds; this environment provides them with shelter, food and a place to breed. Squid feed largely on small fish and shrimp. The squid is an ambush predator that uses stealth and camouflage to capture its prey. As a general rule squid are found in schools, these schools can range in numbers from two to hundreds. The most popular of all of the squid species is the Southern Calamari; this is due mainly to their edible qualities and distribution. When fishing for squid I look for a reef or a sea grass bed with plenty of weed cover that is in around fifteen feet of water. This depth always seems to hold squid, in my opinion this is due to the distribution of their favoured foods through out this depth and also the protection this depth provides from the elements and predators. 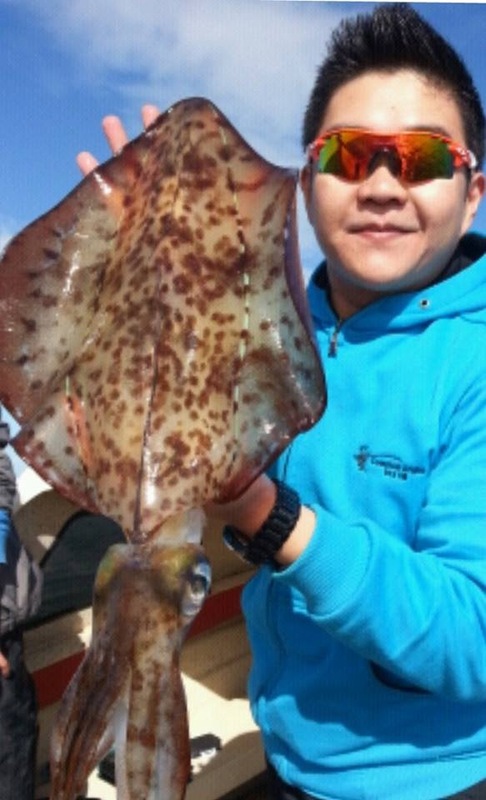 As a general rule you won’t catch squid over bommies but the surrounding waters always prove productive. I seem to find that a flat reef with the odd sand patch and large structures or reefs where large boulders and bommies plateau down to densely vegetated flat reef are perfect squid habitat. Squid will often school on the edge of a reef or grass bed to ambush prey. It’s these locations that often produce the best results. The Southern Calamari ranges in size form one hundred grams and less to well over four kilograms. With this in mind I will always fish with line no heavier than six kilograms, I find that light line makes it easier to work the lure. I have also noticed that the more natural the line colour the more effective the setup. Blue, white and green lines seem to be the most effective. The reason for these colours in lines is the fact that they are less visible in the water. When fishing for squid I like a light to medium rod that has a slow taper. The reason for a slow tapered rod is that you hook a squid by the tentacles and the sharp pins on the lure are easily pulled through the squid’s soft flesh. I find that a slow tapered rod helps absorbs the squid’s lunges and reduces the amount of pulled hooks. Squid lures or jigs now come in many different styles, ranging from garfish imitations through to Prawn imitations. I find that on any given day that all will work; it just depends on the mood of the squid. I find the most popular jig in my collection to be a pink Yo-Zuri in a size 2.5. The reason I’m fond of this size is the fact that it sports two quality sets of barbs (hooks) and it’s not too big for small squid and it’s not to small for big squid. The biggest squid I have caught on a 2.5 Yo-Zuri is just on two kilograms. The colour of a squid jig is another popular topic for discussion. I find that the brighter the day the brighter the colour. I also find that once a jig has been used on a number of occasions it will fade, in my opinion the older and more faded the jig the better the results. I believe the reason behind this is that the faded colours take on a more natural and transparent appearance to the squid, thus imitating the squid’s natural prey more effectively. Still with all this said some days you will never predict what the squids preference will be. When fishing for big squid bait jigs are the most popular method of angling. Baits are usually whiting or pilchards. The squid targeted with this method are generally over the one-kilogram mark. I find that it’s not always practical to carry bait when squid fishing so I carry a jig in the size range of 3.5 – 4.0. These large jigs are great for large squid; they seem to be just the right size to tempt large squid while the smaller ones generally steer clear. Of the larger models of Squid jigs I find the Yo-Zuri and the Razorback brands to be the best. The most important thing I find when chasing squid is the rig used. I find that whenever possible tie the jig directly to the main line. This is not always possible due to current or drift speeds. The reason for this method of rigging is that it enables the jig to sink slowly. In my experience over eighty percent of the squid that take the jig do so as it is sinking. Having the jig attached directly to the main line also enables you to work through a wider range of water levels, while maintain greater feel and control over the jig. On occasions where the drift or current speeds are to quick for the jig to be tied directly to the line you may need to use a Paternoster rig suspending the jig about one meter up from the sinker. When fishing from a boat for squid you should always drift. Drifting helps you cover more ground and thus exposing your jig to a greater audience. The boat should be positioned so that the wind will push it over the desired fishing ground. This is done by positioning the boat upwind of the desired area and letting the wind carry you over the area to be fished. You may at times need to steer the boat to correct any deviations from the desired path. In most instances you should not need to start the motor, just adjust the steering setting. When drifting I try and keep the boat perpendicular to the wind and parallel to the waves, this is done by turning the motor in a direction that pushes the nose into the prevailing wind. A perfect drift is achieved when the boat moves over your desired ground at a slow walking pace. If the wind is strong and the drift fast you many need to use a sea anchor, to reduce the speed of the drift. I have found this technique to be very effective. When you come across a school of squid you have generally two options, firstly you can anchor and then cast into the school. This is usually only done if the drift is quite fast. Secondly, if the drift is slow you can continue casting into the school, it is important to remember the location of the school. As soon as the action slows return to where you first encountered the school and continue to drift. If the squid are still there continue this technique till you have your bag limit or if the action tapers off continue on the drift in search of a new school. For this method to work at its optimum you must cast into the wind or tide so that your jig travels over the entire drift path of the boat. Casting with the wind will not only lead to more snags but you will also leave great areas of your drift unfished. The way you retrieve the jig depends on the type of drift you are experiencing. I always lift the lure (Jig) in a jigging motion. I never jig the lure as soon as the line starts too become taught. I always gradually lift the rod for the first half a meter of the jigging motion, and then I jig as violently as desired. The reason I do this is that it allows the angler to hook any squid that may have taken the jig as it was sinking. This method will prevent a lot of pulled hooks and frustration. If the drift is a fast one you may not need to retrieve any line while drifting. This is an ideal situation as the jig is spending a maximum amount of time in the strike zone. If the boat is stationary you will need to cast and retrieve your jig. The action that should be adopted is one where you cast the jig, let it sink nearly to the bottom, then lift the rod in a fashion that the jig rises and moves a couple of meters, then let the jig sink again and repeat the process all the way back to the boat, pier or shore. If your drift is exceptionally fast you may need to deploy line for the jig remain in the strike zone. The jigging motion employed by the squid angler should vary. Some days the squid will fancy a fast erratic jigging motion, while other days will see the squid favour a slow lifting motion or even no motion at all. Be prepared to experiment with your retrieve to obtain the best action for that given day. On clear calm sunny days there are occasions when you will be fishing for squid and the water is very clear, this can at times be a very frustrating situation. The schools of squid can be easily seen, yet you will often struggle to catch them. In my opinion this is due to the fact that all prey is cautious and all predators precautious in their approach to ambush due to their venerability in such clear conditions. In such situations I use the predatory instinct in the squids biology to aid in their demise. I cast my jig fifty meters and let it sink, if I don’t catch a squid on the jig’s decent I retrieve the jig with haste for ten-meter bursts, then let it sink again, this movement imitates an injured and scared baitfish and the squid generally charge in and attack the jig instinctively. This technique is quite effective and will work more often than not when the squid are as I call them “Lookers”. Many people are put off catching squid due to the ink they excrete on and during capture. If you take your time in landing the squid generally they have no ink left to squirt in or at your boat. The best way to avoid a squid deploying black ink in your nice and clean boat is to utilize a twenty-litre bucket. Simply lift the squid out of the water and place it in the bucket. You should always point the bucket away from the boat. Now in this theory the squid squirts the ink as it feels its body come to rest in the bottom of the bucket, with the bucket pointed out from the boat the splashes of ink disperse over into the water and not in the boat. This is an art, yet once mastered you will swear by this method. My second method on landing squid with minimal mess is to net them. The first thing you need to remember about landing squid is that un like fin fish the squid swims in reverse so you must net it from behind. I net the squid and then I slightly tilt the net so when the squid expels its ink it is dispersed into the water and not the air. This method is very effective especially with big squid and cuttlefish. Good luck and remember to limit your catch, not catch your limit.